Use these reports and resources to gain insight into how California’s children are faring and advocate for change. 2018 California Children’s Report Card shows, the vast majority of our state’s children face extraordinary challenges to reaching their full potential. Yet, the success of California’s economy and civil society ultimately depends on policies that tear down these barriers and give all kids access to the quality support they need to succeed—from quality, affordable child care to a rigorous education to health coverage to safety. 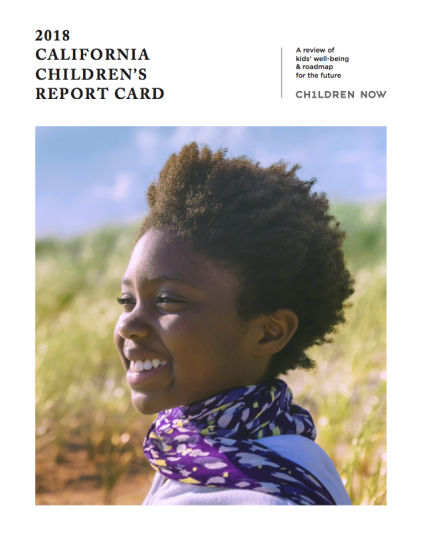 An interactive, online report, the 2018-19 California County Scorecard of Children’s Well-Being delivers a current and comprehensive picture of children’s health, education, and welfare in every one of California’s 58 counties. This report provides county-level data mapping, tracking key indicators of child well-being across counties, over time, and by race and ethnicity. 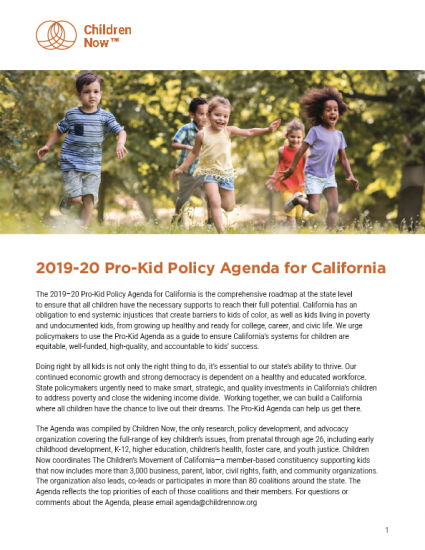 The 2019–20 Pro-Kid Policy Agenda for California is the comprehensive roadmap at the state level for policymakers, stakeholders and others who want to ensure that all children have the opportunity to reach their full potential. In the first three years of a child’s life, foundational brain architecture is established, making children’s earliest experiences the most important. The creation of healthy brain architecture is dependent on good health, positive and nurturing relationships with adults, exposure to enriching learning opportunities, and safe neighborhoods. Medical and dental professionals‭, ‬health plans‭, ‬clinics‭, ‬and the various systems in‭ ‬a young child and family’s life should communicate and coordinate to advance a child’s oral health‭. Especially for younger children‭, ‬quality health care through Medi-Cal has the potential to improve their lifetime trajectories‭, ‬overall population health‭, ‬and long-run efficiencies‭. Children Now applauds the Governor’s proposed budget which makes needed pro-kid investments in supports and services that will improve the lives of California’s young children. The Mental Health Services Act provides funding to counties to improve children’s mental health. Learn from three counties that are leveraging MHSA funds to better coordinate care for children and youth. California must improve developmental screenings for young kids. 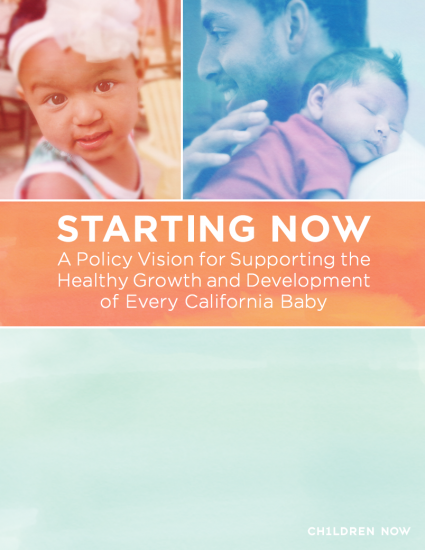 All kids should receive routine developmental screenings ot identify any potential developmental delays, yet, California’s screening rates are worsening, dropping from 30th in 2012 to 43rd in 2016. Research shows relationships fuel early brain development and provide the foundation for lifelong health and success. Home visiting can support parents in building these relationships during a physical demanding and emotional time.